Be the first to hear about their new releases and deals. Download the Booksprout app and search for Sadira Stone today! Ever since her first kiss, Sadira’s been spinning steamy tales in her head. After leaving her teaching career in Germany, she finally tried her hand at writing one. 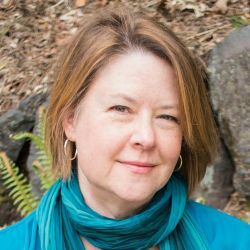 Now she’s a happy citizen of Romancelandia, penning contemporary romance and cozy mysteries from her home in Washington State. When not writing, which is seldom, she explores the Pacific Northwest with her charming husband, enjoys the local music scene, plays guitar badly, and gobbles all the books. Visit Sadira at www.sadirastone.com.